Ten years ago, digital out-of-home was in its infancy; a blank canvas yet to be painted with the exciting content we see today. Film marketing was still very much focusing on the traditional channels of TV, print and OOH; video-on-demand and pre-roll ads had only just started to appear. In fact, online was where film marketing first started experimenting creatively. However, as the functionality and scale of Digital OOH has expanded, so too, has the way in which entertainment brands use it. Fast forward 10 years, and things have changed dramatically. Today, digital inventory has given OOH film campaigns a new lease of life, adding some movie magic to outdoor executions. Now marketeers can run trailers and video content on the street, introduce characters, plot teasers, or run live-action sequences, direct from the film to whet the public’s appetite. Digital OOH has become the ideal advertising channel for the entertainment industry. There’s been experimentation. It started in 2006 with Rocky Balboa running up the first digital escalator panels on London Underground, changing the way we thought about multi-panel creative. It continued with Legend of the Guardians, which saw a campaign from Warner Bros pioneering subtle motion on roadside screens, a motion format that’s now an international standard. In 2011, Harry Potter and the Deathly Hallows Part 2 streamed its world premiere live to DOOH screens. Then there was the Jurassic World execution at Waterloo, which combined, traditional OOH, station wraps, Digital OOH and experiential. And a variety of AR and VR activations were used across the world for the release of supernatural horror IT. 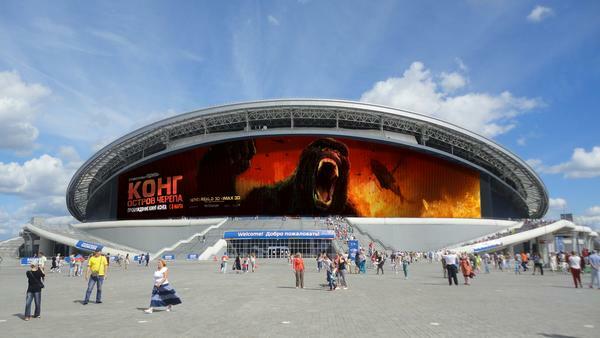 There is real momentum to this creative evolution, and advertisers are changing the way they create and use OOH media. From static branding channel to high impact PR vehicle, DOOH now live streams worldwide premieres, provides immersive augmented reality events and delivers iconic treatments tailored for iconic buildings, environments and screen locations. Now OOH can be engaging, immersive, participatory, integrated and scalable. Connecting with film fans on a deeper level is now achievable. Digital OOH offers interaction via a multitude of creative technology solutions. A campaign for Dr Strangeopened up live portals between sunny Los Angeles and rainy London, and allowed people to warp the world in front of them. An AR campaign for Batman v Superman allowed participants across several markets to become their favourite superhero. And these aren’t just one-off special builds, we’re seeing interactive campaigns becoming more scalable: it’s now possible to produce engaging, responsive experiences seamlessly across borders and markets. The digitisation of OOH has also enabled outdoor creative to become firmly embedded in the broader digital strategy, playing a central role in an omnichannel execution. The power of social media and its influence over box office results means that OOH can be a great conduit for driving audiences online, and vice versa. Digital outdoor activations can be crafted to generate shareable content for garnering audiences online. For the recent launch of season 7 of Game of Thrones, dramatic fan reactions posted on social channels were shared moments later on digital screens across the UK, tapping into the buzz and excitement of the show whilst delivering a powerful UGC endorsement. Interestingly, Digital OOH has also begun to influence other channels, with its content nowadays seen at movie premieres and press junkets, as well as within online banner creative and social feeds. Digital OOH’s presence and ubiquity in cities around the world is also part of its allure to the film and entertainment industries. Film campaigns demand an international rollout, and as DOOH spend overtakes traditional OOH revenue in markets around the world, this has forced us to change our approach. Nowadays scalability is vital to production processes, so now we use master creative toolkits and flexible creative that can adapt to all the different shapes, sizes, durations, environments and audiences of the screens we’re faced with. To give you an idea of that scale, in 2017 we delivered over 12,500 files to 52 markets, from Guatemala to Kazakhstan. Localisation and delivery become paramount, as does sophisticated ad-serving technology from QDOT. Now multiple markets can take advantage of a toolkit of creative rather than the traditional siloed approach. So, what next? It’s undeniable that Digital OOH has become a major marketing channel for film studios and entertainment brands. Moreover, the film industry has become a major driving force for the continued development and evolution of global Digital OOH campaigns. Now that the production processes have been nailed and the intelligent ad-serving infrastructure is in place, we expect to see truly global campaigns that deliver local relevance become the new standard. Combined with tactical, interactive and cross-channel strategies, the marriage between film marketing and digital OOH looks set to blossom. First published by Contagious here.